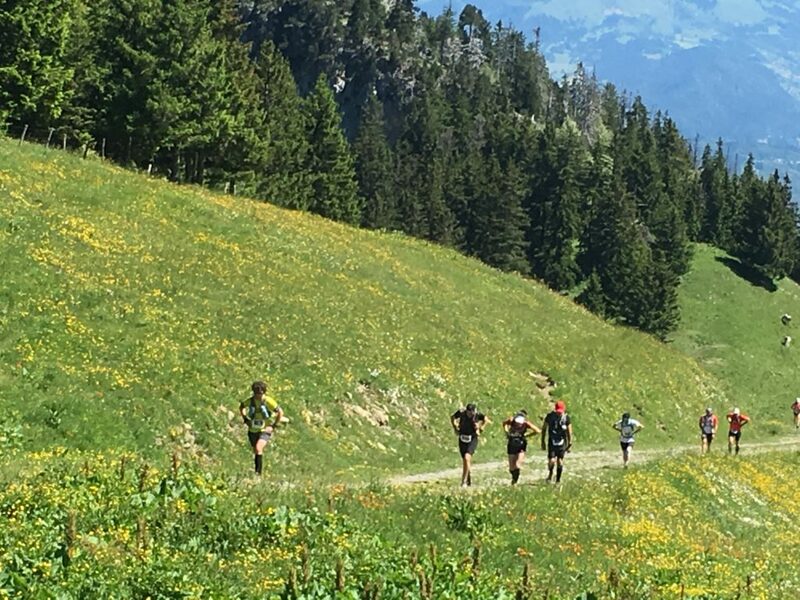 It was two weeks ago on Sunday that I participated in Trail de Faverges series. I enrolled in Maratrail de la Sambuy, a 49km trail race with 2800m elevation gain. The race took place in Faverges, a small town situated in the southeast of France. 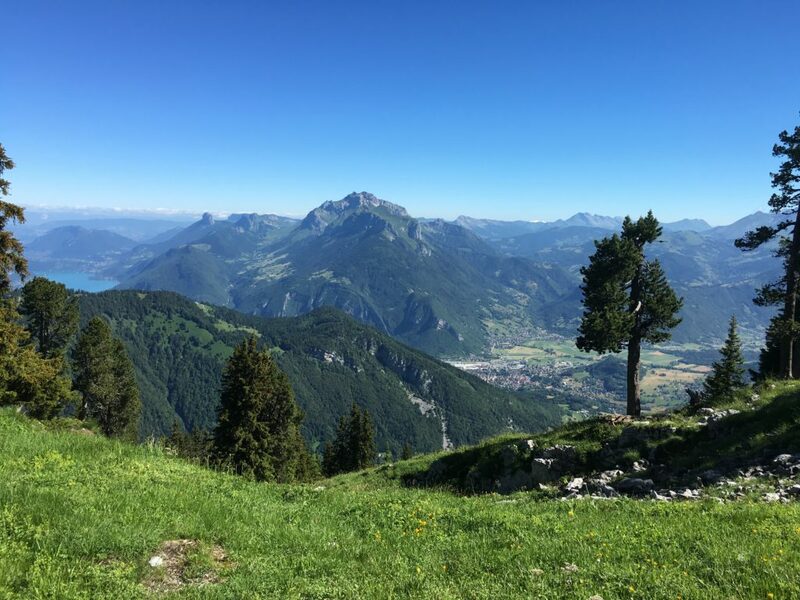 Faverges is located just 25km away from the more well-known Annecy. I considered it my first real ultra trail race since I settled in France (EcoTrail de Paris does not count :-)). I am currently living in Ile de France, and surrounded by numerous forests with runnable trails. Hélas, the hills in this region on average do not rise more than 180m. Hence, it is impossible for me to incorporate long climbs/descents in my trainings! Moreover, the surrounding trails are generally not as technical as those in the mountains. As such, it was with apprehension of suffering and DNF that I counted down to race day. Around 6am on the race day. Photo was taken as I walked down from my hotel at La Tertonoz, a village 3km away from the race start. The mountains in the background – I would be ascending them later that day during the race. The race started at 7am in the centre of Faverges. The morning temperature hovered around early-teens but reached around 30°C by late morning. However, the heat was actually quite bearable with the occasional breeze. Or maybe becauseHong Kong’s sweltering summer had trained me well! Indeed, I could take the heat so well that I actually declined the occasional volunteers’ offer to spray water on me with their hose or their little watering cans! However, as I was wearing a sleeveless top with no sunblock coverage, my shoulders and my upper arms got burnt by the sun. They turned lobster red the following day, and my skin started shedding like reptiles on the third day. It was a picture perfect day – clear blue sky, verdant forest, and magnificent mountains. 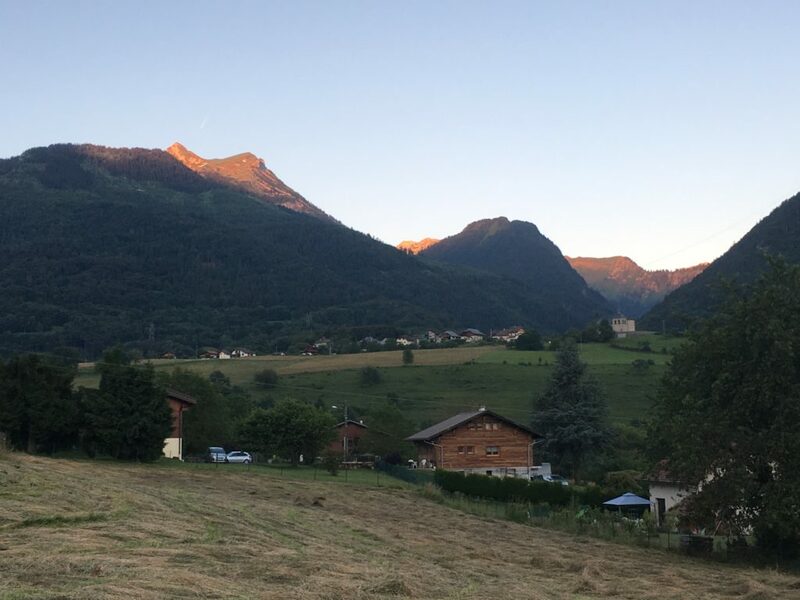 Around the midpoint of the circular race route, one could have an unobstructed view of the snow capped Mount Blanc mountain range. Towards the end of the route, runners prepared their descent to the finishing line with a poster card view of the body of turquoise water of Annecy Lake. The forest trails were quite technical with plenty of roots and rocks. Some sections were so narrow that it was only wide enough for an Indian file. It was on one of these sections that I tripped and fell off the trail. Fortunately, I managed to grab the edge and pulled myself up. Other than suffering from a great fright, and some scratches on my limbs, I was otherwise unharmed and able to continue the race. If I had not grabbed onto the edge, I would have tumbled down and bear more than just some superficial scratches. The long descents from the peaks were not fun either. Gravel covered the trails, and some of these fragments were actually quite big. So, running down on these paths definitely trained my quads, ankles and agility. It was a very well organised race. In the beginning, I was worried that with only 350 participants, I would get lost!. However, signage was clear and plenty- even a person like me without sense of direction could not get lost. Organiser stocked the checkpoints with the essential refreshments – Coca Cola!, cheese, oranges, cereal bars, sweet bread, sausages etc. Friendly volunteers were spread out along the route at the various junctions. 350 people started the race, with 241 at the finishing line. The 9-hour finishing cut-off time was tighter than the others I have come across, and I barely managed able to scrape through. Top of the first climb, Sommet de Sambuy.